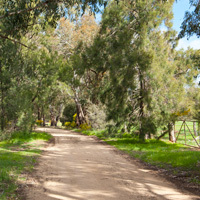 McKindlay’s Riverine Nursery is nestled in amongst a farm property going by the name of Eulinya Downs positioned along Perricoota Road running beside the majestic Murray River. 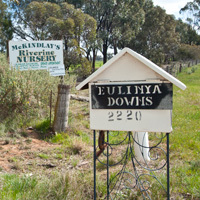 McKindlay’s Riverine Nursery was established in 1985 by John and Deb McKindlay who have worked and lived on the farm for over 35 years. The native nursery was established mainly for friends and family to get local plants that were unavailable elsewhere, but since then it has grown with over 60 varieties propagated on the premises by Yolanda McKindlay, the daughter of John and Deb. All plants come in 40 cell hiko trays which provide the best quality growth for plants, easy to come out and to handle. The farm property is home to 1,100 Centre Plus Merino ewes, Merino lambs and Border Leister x sheep, all bred for their wool and meat. 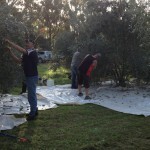 Many of the trees around the property provide most of the required seed, specially selected for the nursery. Other seed is collected in other districts including Picola and Deniliquin, or purchased through the Murray Catchment Seed Bank. If you require any advice on how far apart to plant or how many plants required for your property, please do not hesitate to contact us, we are sure to help you out. Our services include delivery if required, hire tree planter, and other products including stakes and cartons. We are opened by appointment, as we are a wholesale business, though if you do call by, we are more than happy to help you. 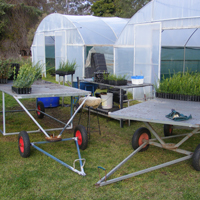 We cater for farmers, property owners, group and organisations like Land Care and SSP, as well as tenders, local shires and those wishing to plant large numbers of plants on a new block, or for revegetation.